A few comments after the Presentation Day. You are here: Home / Nieuws / A few comments after the Presentation Day. During a warm summer Tuesday evening at the stable of Cool Horses NV (the stable of the international dressage rider Isabel Cool) the selected foals were filmed and photographed for the final auction on August 1 in Stable Hulsterlo (during the Belgian Championship Dressage). 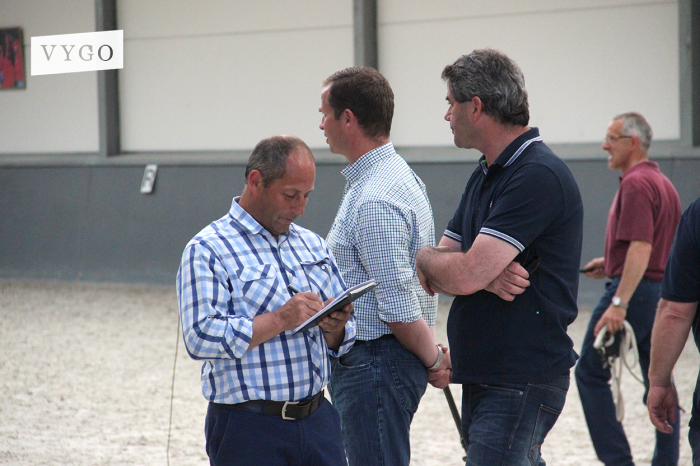 To provide the foals of professional comments, the help was called in from three renowned men in the dressage world. Gertjan Van Olst, Eddy Schuurmans and Philippe Jorissen Gertjan Van Olst runs a respected breeding company in the Netherlands named Van Olst Horses. Eddy Schuurmans is a member of the committee pedigree Dressage of the Belgian studbook BWP. Philippe Jorissen is a professional dressage rider and represented Belgium numerous times at the highest level in the dressage sport. Philippe: “The auction last year was a success, and not only the quality of the foals but also by offering these foals in one location. It is often difficult for a professional rider to ride to breeders to see there foals. At the Belgian Championship you see immediately a good selection of foals where you can make a choice, which is a huge advantage.